As we start creeping into 2012, we are sure to see more quad-core devices fill the headlines. In late of last year, we saw leaked images of the HTC Edge and the HTC Zeta which had many folks chirping for them to quickly become a reality. 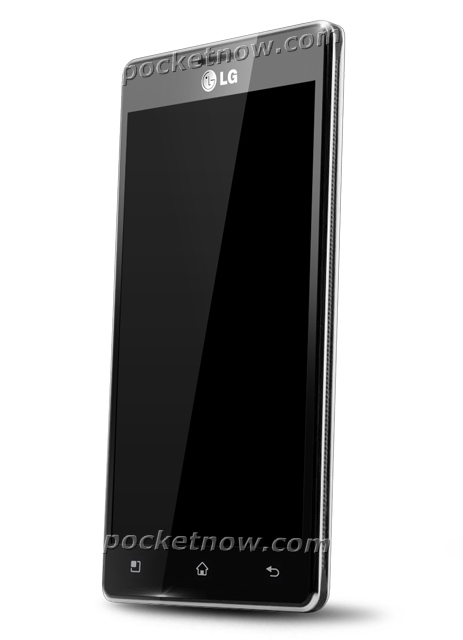 Today, we have another leaked render thanks to Pocket Now showing LG’s rumored X3 device. The X3 is powered by NVIDIA’s Tegra 3 quad-core processor and is said to possibly run Ice Cream Sandwich out of the box. Along with its impressive processing power, the X3 has a 4.7″ high resolution display along with an 8MP rear camera. The main question most here might wonder is which radio would the X3 house. Unfortunately, it’s looking like a 21Mbps HSPA. No quad-core love for Verizon users yet. But with the Mobile World Conference (MWC) just around the corner, who knows what goodies are in store. Is anyone hoping that Verizon finds themselves as the home of a Tegra 3 device by year’s end? Is a quad-core even enough to make you switch to an LG made device? SOPA Has Been Postponed Indefinitely.